Today the world embarks on four of the most joyful days of the calendar. It’s something the faithful look forward to all year and celebrate with adulation that is refreshed anew each spring. Now, that statement may cause confusion between groups secular and sacred. The sacred will, of course, think I’m referring to the Easter holiday. The sports-minded will offer a secular amen because they think I’m referring to baseball’s Opening Day and the return of The Masters to Augusta. I think I’ve found a way to bridge the conversational gulf. I was thinking of the bobblehead phenomenon yesterday when I was sitting in the bar contemplating the bobblehead of St. Francis of Assisi, one of the most revered religious figures in history. It is said no one in history showed more devotion to imitating the life of Jesus Christ than St. Francis. I asked Dave, the owner, how he came to possess a bobblehead of a major religious figure who I at first mistook to be a Friar Tuck bobblehead. I didn’t think about it until later, but intend on asking him today if the St. Francis bobblehead, made in honor of the patron saint of animals and the environment, has had any spiritual impact on the clientele. Like do customers behave less wolflike than before he acquired the bobblehead and maybe show a greater propensity toward recycling. Dave’s great for that. You can ask him anything and he’ll give you a thoughtful answer. Just the other day I asked, given the immutable laws of gravity, why did the Coyote always without fail fall more swiftly than the anvil? Dave said the laws of slapstick cartoon comedy supersede the laws of physics. Dave’s got 80 bobbleheads on display in The Pond, and I’d put his collection up against a more widely touted one being unveiled this week at the lavish new Miami Marlins Ballpark, home to what is mistakenly billed as the Bobblehead Hall of Fame. It features 588 bobbleheads and it looks like fewer than half of them represent real players inducted in the actual hall of fame. What is cool is the display is geared to shake so the bobbleheads are always bobblin’. The news made Dave envious. He said he’s going to try and think of a way to generate some energy that will make his bobbleheads bobble. I told him coordinating the bathroom breaks of three or four of his more bobble bellied customers would probably do the trick. His collection takes a back seat to none. It includes bobbleheads of Albert Einstein, Pirate announcer Bob Prince, Dudley Do-Right -- and this is key -- the great Arnold Palmer. The Pirates gave away Palmer bobbleheads on AP’s 80th birthday in 2009. I think it’s one of the greatest bobbleheads in bobblehead in history. Palmer represents all that’s great about sports and life. In fact, there’s only one bobblehead superior in that regard. That would be bobblehead Jesus. Of course, there’s a Jesus bobblehead. In fact, there are dozens of them. My favorite is “Buddy Christ,” which has the bearded one winking and giving the thumb’s up signal. I even saw one bobblehead that showed Jesus wearing a t-shirt that reads “Jesus hates Obama.” And I don’t believe that for a second. If a Jesus bobblehead hated anyone it would be probably be bobblehead LeBron James for his Judas-like betrayal of Cleveland, but I don’t believe that either. Like the man, bobblehead Jesus is all about love. And that’s as it should be. The St. Francis bobblehead had me wondering if there were any apostle bobbleheads. You’d think there’d be at least a Judas bobblehead because there’s a Osama bin Laden one. I learned this when I read that the Gettysburg Museum store was pulling its John Wilkes Booth bobbleheads after a controversy erupted over having the Derringer-wielding villain within firing range of the bobblehead Abraham Lincolns. Matt Powers of the Kansas City-based Bobblehead company said they’ve made more than a million bobbleheads and have never had one pulled until the bobbling Booth. I respectfully disagree and cite as my role model the Jesus bobblehead. He’d forgive the Booth bobblehead. He’d forgive the Judas bobblehead, if there is one. 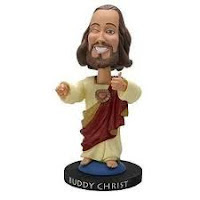 Yes, bobblehead Jesus would surely turn the other cheek. But then again, isn’t that what all bobbleheads do? Hi to all,I just stumbled upon your web site and wanted to say that I have genuinely enjoyed reading your website posts.Thanks for sharing the blog with us.